The classic American eatery, 14K Restaurant and Lounge at The Hamilton Hotel D.C., has announced Nezzar Battle as its new Executive Chef. Chef Battle brings more than a decade of top-flight culinary expertise to his new role at 14K, having previously shaped menus at popular hotel and resort restaurants in some of the country’s favorite tourist hotspots. 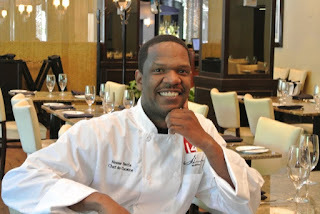 Battle, enters the DC area food scene from Orlando, Florida, where his fresh approach to local flavor delighted diners at the Kessler Collection Bohemian Celebration Hotel. Prior to his tenure there, Battle oversaw kitchen operations at the 4-Diamond Squaw Creek Resort in Lake Tahoe, as well as at Silver Tree Hotel in Aspen, Colorado. 14K Restaurant at the Hamilton Hotel DC is open for breakfast, lunch and dinner every day from 6:30 AM to 11 PM. For more information or to make reservations at 14K, please contact 14K by phone at (202) 218-7575 or (202) 218-7540, or online at Hamilton Hotel D.C.. The Hamilton Crowne Plaza D.C. is a distinguished, unique, 1920’s boutique-style hotel in Washington D.C. that is located at the intersection of 14th and K Streets, near the White House and the area’s best attractions. The hotel showcases 14K restaurant and lounge, featuring award-winning regional American contemporary cuisine, premium martinis and a handcrafted wine list. The 14K restaurant patio overlooks Franklin Square Park and is the place to be seen, people watch and enjoy the finest dining experience in Washington D.C. With nearly 5,000 square-feet of flexible event space, Crowne Plaza The Hamilton offers premier, customized service to host board meetings, receptions and events for up to 700 people. Follow The Hamilton Crowne Plaza D.C. on Facebook and Twitter.